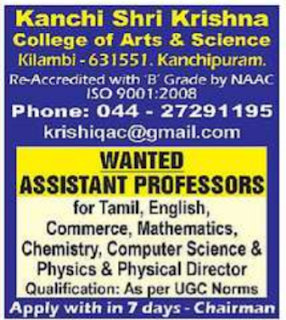 Kanchi Shri Krishna College of Arts and Science, Kanchipuram has advertised in THE HINDU newspaper for recruitment of Assistant Professor jobs vacancies. Interested and eligible job aspirants are requested to apply with in 7 days. Check out further more details below. 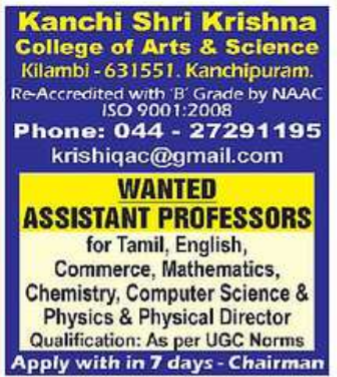 Name of the College :Kanchi Shri Krishna College of Arts and Science, Kanchipuram. Kanchi Shri Krishna College of Arts and Science was started in the year 1994 by Kanchi Krishna Educational Trust for the promotion of higher education in the backward area of Kanchipuram Taluk. Started as Under Graduate College, affiliated to the University of Madras, it has steady growth and now it stands as Research Institute offering 12 Programmes in UG , 6 Programmes in PG,3 programmes in M.Phil and 3 programmes in Ph.D. The vision and mission of the Institution as enshrined in the Kanchi Krishna Educational Trust, is to impart quality higher education, so as to make the ‘New Generation’ face the new challenges of the ever changing society. How to apply: Interested and eligible candidates can apply with in 7 days.